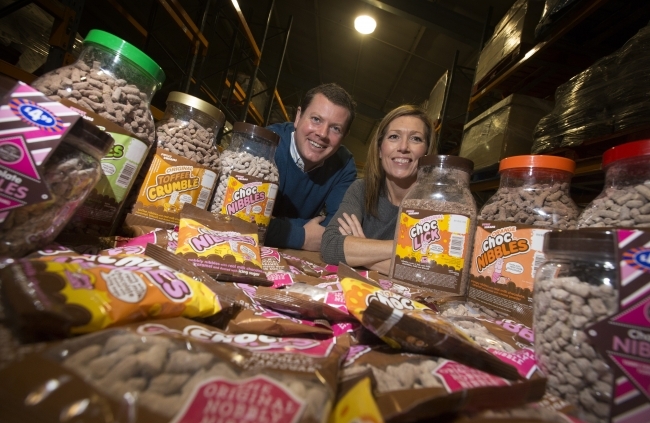 North East based chocolatier Sweetdreams has invested £500,000 in a new 15,000 sq. ft. factory which will drastically increase the company’s output and create a variety of new jobs for the region. Sweetdreams, creators of Choc Nibbles, have experienced unprecedented growth in the past twelve months and now the business is looking forward to maintaining its rapid rise as a leading name in the confectionary industry as they prepare to move into a larger factory, recruit across the business and launch a variety of new products. The factory move has been made possible through substantial company growth of 32% over the past financial year. This has been achieved in part from extended discount sector penetration, new product development, international export, including the company’s first export to Ireland, and proactive development of their extensive existing customer base. The new factory, based in Cramlington, has been built to BRC (British Retail Consortium) standards with the expectation of achieving the globally recognised accreditation within six months. The new unit is 50% larger than the existing factory and will allow Sweetdreams to double their output at a minimum. The factory will initially produce 25 tonnes of product per week with capacity for more. Matthew Stephenson, owner and managing director of Sweet Dreams Ltd said, “We already have the keys to the factory and will be operating from the new premises from early October. This is a really exciting time for Sweetdreams; we identified a gap in the market for a high end chocolate coated product and so we have invested £200,000 in panning and coating technology. This new process will allow us to enhance existing product offerings, develop new products and reach out to brand new markets and customers. As part of the expansion, three new senior staff members are already in role. All leading names in the confectionary world, Andy Baxendale – star of the recent BBC documentary ‘The Sweet Makers’, Mike Flower and Mark Robinson come with a range of influence, experience and technical skill as well as over 100 years of combined chocolate making experience.